The Circus ´Ring of Fame´ recognizes those persons who have made a significant contribution to the art and culture of the circus. With dozens of inductees from around the world, the Ring of Fame began in 1987 as a way to honor world famous circus performers and the rich circus heritage of the Sarasota area. Each year, Ring of Fame honorees are nominated by the public and voted on by former inductees. Each inductee is then honored with a bronze wagon wheel plaque, which recognizes their contribution to circus art and heritage and recognizes their ´sponsor´. The annual Ring of Fame ceremony is an veritable who’s who in the circus world, as current and past performers gather to honor their peers. 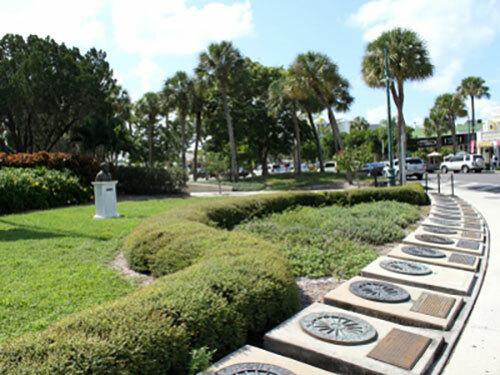 The Ring of Fame graces a central park located at St. Armand’s Circle in Sarasota, Florida. There, visitors and locals alike stroll past decades of circus history, reading the plaques and conjuring up childhood memories of circus greats such as famed animal trainer Gunther Gebel-Williams, astounding aerialists the Flying Wallendas and Lillian Wetzel, timeless clowns Lou Jacobs and Emmett Kelley. Also of note, the Ring includes the most famous showman of all times, P.T. Barnum, as well as the visionary who brought the circus to Sarasota, John Ringling. The list goes on and on!